The AUD and the CHF are close to each other with their score. When looking at the Weekly TA Chart it is clear to see that this pair is consolidating. Price is in the Ichimoku cloud with no clear direction. It is below both averages; Tenkan Sen and Kijun Sen but when looking at the MACD it is in positive area. The pair made several tops around 0,7550 in the last half year and is making higher bottoms. AUD/USD, AUD/JPY, CHF/JPY, CAD/JPY, AUD/NZD, EUR/JPY and the NZD/JPY. AUD/USD, AUD/JPY, CHF/JPY, CAD/JPY, AUD/NZD and the NZD/JPY. 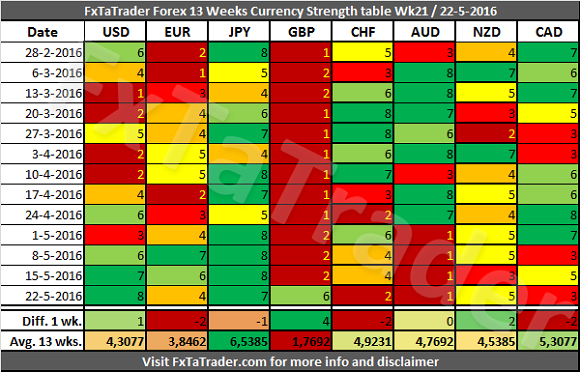 Almost all the pairs seem to be interesting according to the combinations mentioned in the crossed join here above except for the USD/CAD and the USD/CHF. 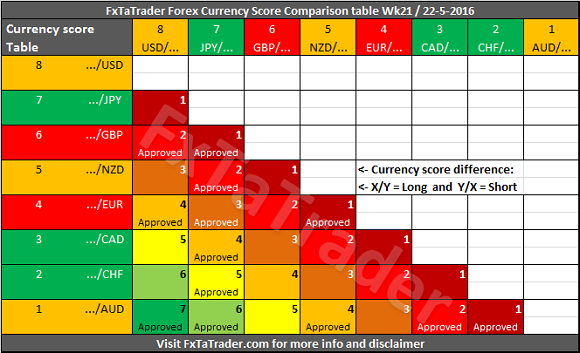 Same for the "Currency Comparison Table", the USD/CAD and the USD/CHF are not mentioned as "Approved".